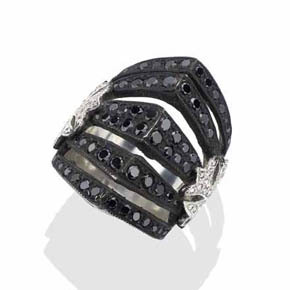 Lazaro’s Jewelry is amongst the most original and eye-catching in the world. 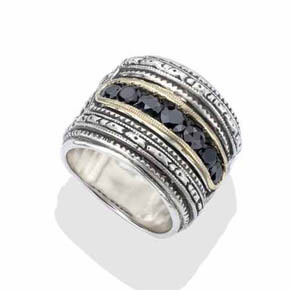 Our secret is a combination of unique designs, beautiful precious metals, and master craftsmanship. 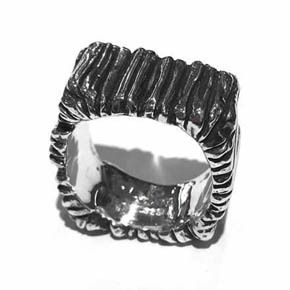 A Lazaro ring is the perfect piece for making a statement of style and class, one that can be found on both musicians and artists across the globe. The precious metals (Brass, Silver, Gold) and stones (Diamond, Onyx, Ruby) are second in value only to the craftsmanship and artistry put into every piece. 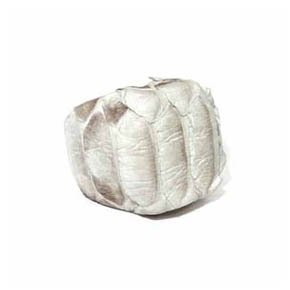 Lusterous sterling silver shines at the incorporation of a python skin body for this fascinating men's signet ring. 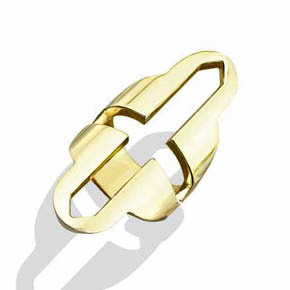 Add a little gusto to your accessories with this chic ring. 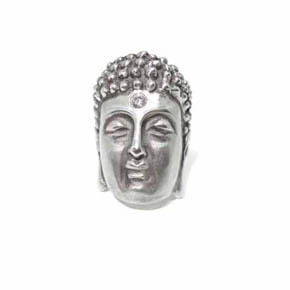 Open your reality to a new life and love, turn a new leaf to the unknown with this alluring sterling silver Buddha ring. 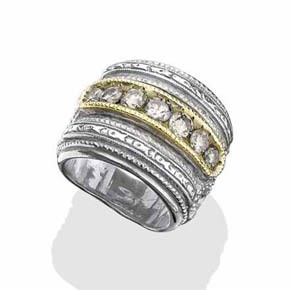 Ring features a white diamond and skillful artistic details. 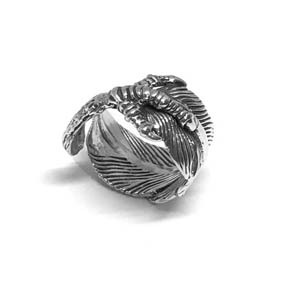 The flair of this unique sterling silver ring is sure to have everyone talking, the eagle feather and claw display detail-rich designs closely resembling a live feather. 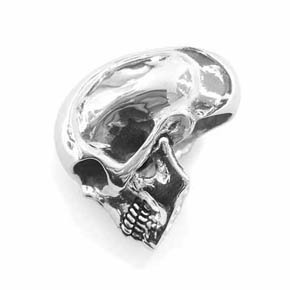 Add this piece to your collection! 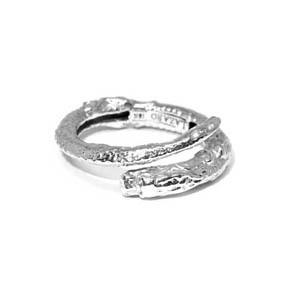 A unique addition to any wardrobe, the artistically handcrafted and limited edition bezel lion ring. The antiqued lion coin and bezel has been set in 18 karat gold and displayed on a detail-rich sterling silver ring with a dark patina finish. 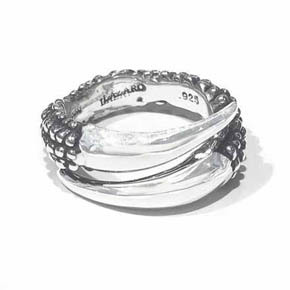 Inspired from wood cravings, this detail-rich sterling silver band features intricate carvings on all sides. 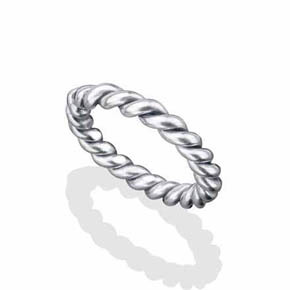 This comfortable double claw ring comfortably and securely grips the wearer's finger. 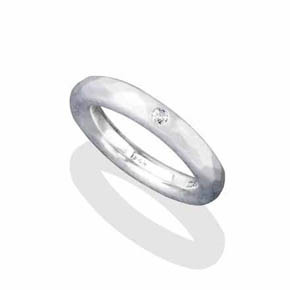 Polished realistic detailing lend naturalism and sparkle to the hand. 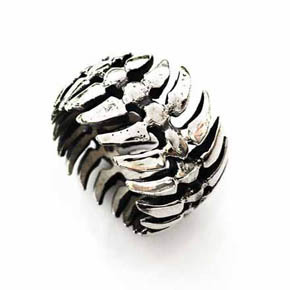 Taking it to the next level, this sterling silver vertebrae ring features a high level of detailing and craftsmanship. 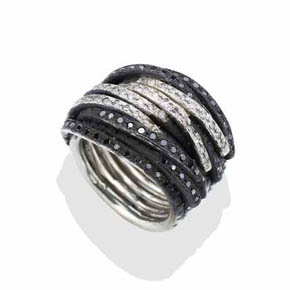 This is a comfortable ring that will add an edge to your wardrobe. 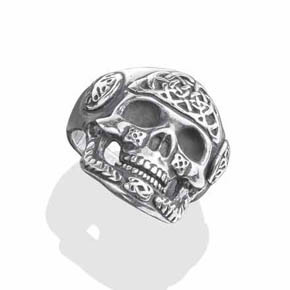 This stunning high polish sterling silver skull ring is hand-crafted with super fine detail. 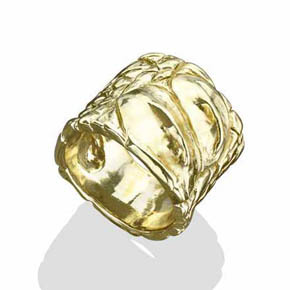 Bold 18kt gold gothic ring for men that bears the authentic character of its craftsmanship. 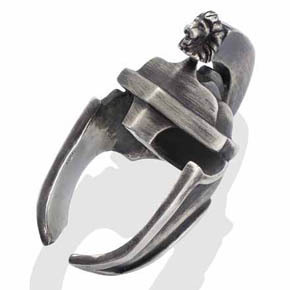 Brushed sterling silver spartan helmet ring forged by hand and accented with a lion. 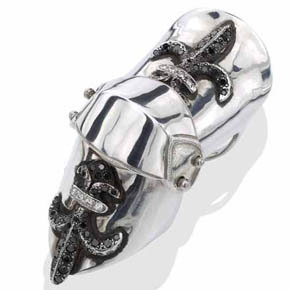 This sterling silver claw ring coated with a black patina is punctuated with black and white diamonds. 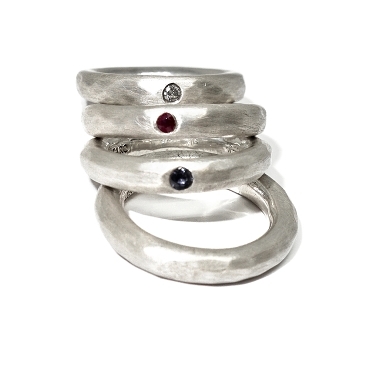 Sterling silver sapphire ring with diamonds and 18 kt gold forged by a process that reveals the authenticity of its craftsmanship. 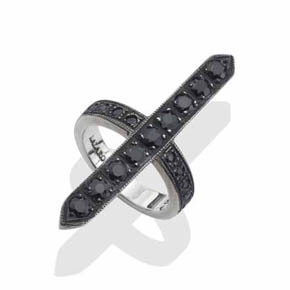 Hand crafted sterling silver cross ring set with black sapphires in a dark patina. 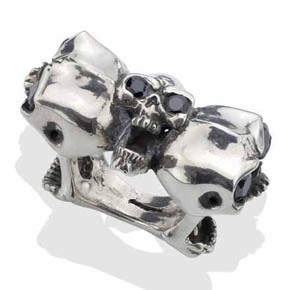 The expressive quality of this sterling silver screaming skull ring inset with onyx eyes is complimented by the constrast between high polish and a dark patina. 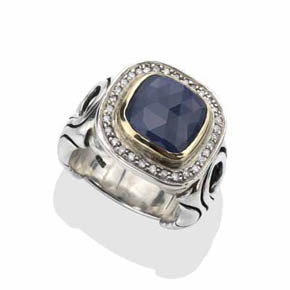 Sterling silver ring with an ornate setting of white diamonds featuring a sapphire against 18kt gold. 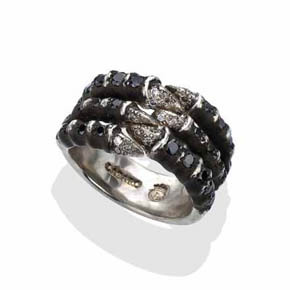 18kt Gold gothic ring featuring diamonds contrasted by a dark patina applied by hand. 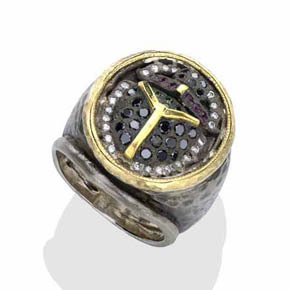 This hand crafted sterling silver ring detailed with 18k gold is a variation on our Jimmy Page ring set with black onyx. 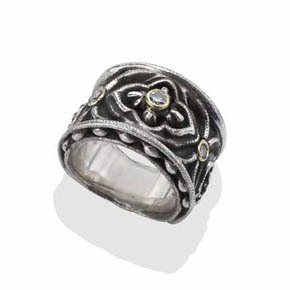 The gothic appeal of this sterling silver and 18k gold church window ring is complimented by a champagne diamond. 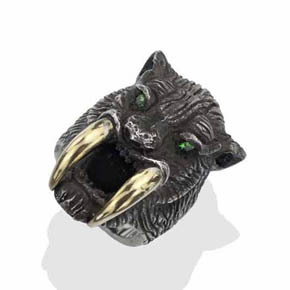 The piercing 18kt gold canines detailed on this sterling silver sabertooth tiger ring are complimented with two striking tzavorite eyes. 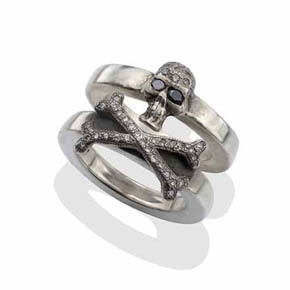 Handcrafted sterling silver skull and cross bones two piece ring with black and white diamonds. 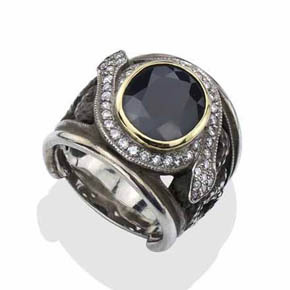 Rubies with black and white diamonds beautifully compose this sterling silver scarab ring with 24kt and 18kt gold. 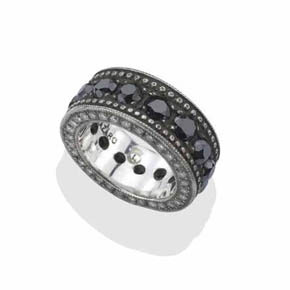 Black and white diamond helmet ring with a hand applied patina over sterling silver and detailed with a cross motif on either side. 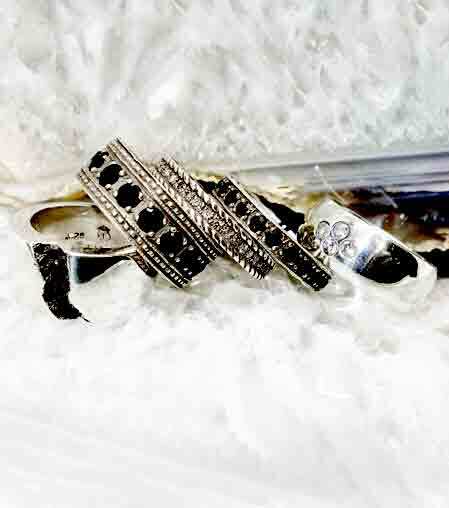 This sterling silver Fleur De Lis ring set with white and black diamonds is a handmade gothic armor ring. Jointed ring covering the full finger. 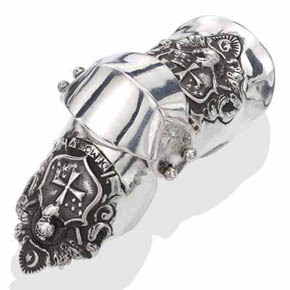 This sterling silver armor ring is handmade and bears a shield and coat of arms. 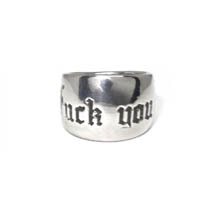 Hinged ring fit to full finger. 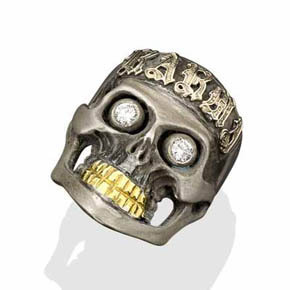 This unique handmade skull ring is a sterling silver ring, the lettering for this karma ring is 14k gold, the teeth are 24k gold overlay and the eyes are white diamonds. 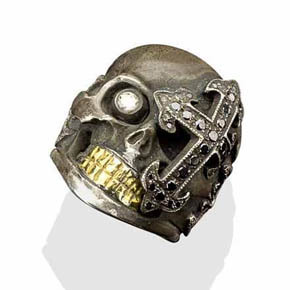 This unique handmade skull ring is a sterling silver ring with 24k gold overlay, a black diamond cross and a white diamond eye. 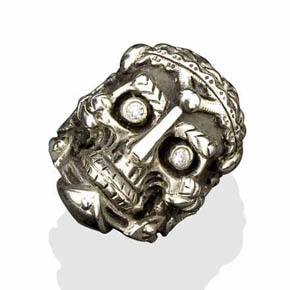 This unique handmade skull ring is a sterling silver ring with a laurel leaf motif and white diamond eyes. 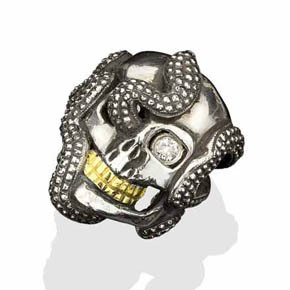 This unique handmade skull ring with snake is a sterling silver ring with 24k gold teeth overlay and a white diamond eye. 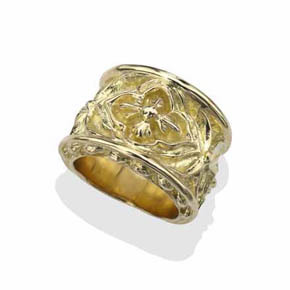 This unique handmade solid casted brass ring features our Open Cross ring design. 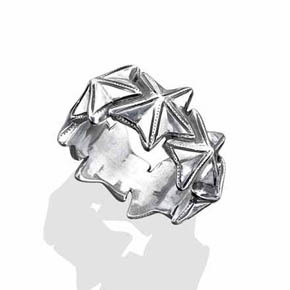 This unique handmade star ring is a silver ring that features our three dimensional star design around the band. 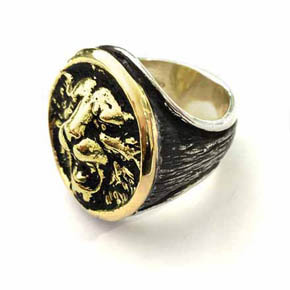 This unique handmade high polish brass ring is engraved with a crocodile skin motif. 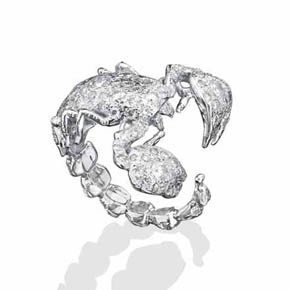 Our unique and popular scorpion ring paved with 3 carats of white diamonds. The collector will appreciate the hand touch and craftsmanship. 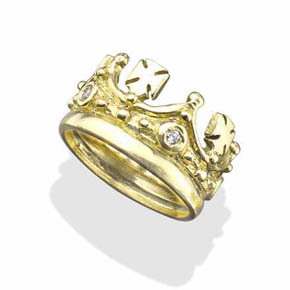 This unique handmade crown ring is an 18K gold ring and features white diamond and cross accents around the ring. 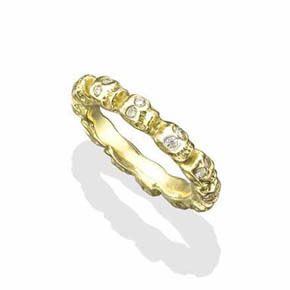 This unique handmade skull ring is an 18K solid gold ring with repeating skulls that have white diamond eyes.